Publikumsgespräch – sound and light installation. Created during a three month residency at Berlin’s ZK/U, Center for Art and Urbanistics, for “Extended OPENHAUS - Berlin Art Week" 2017”. 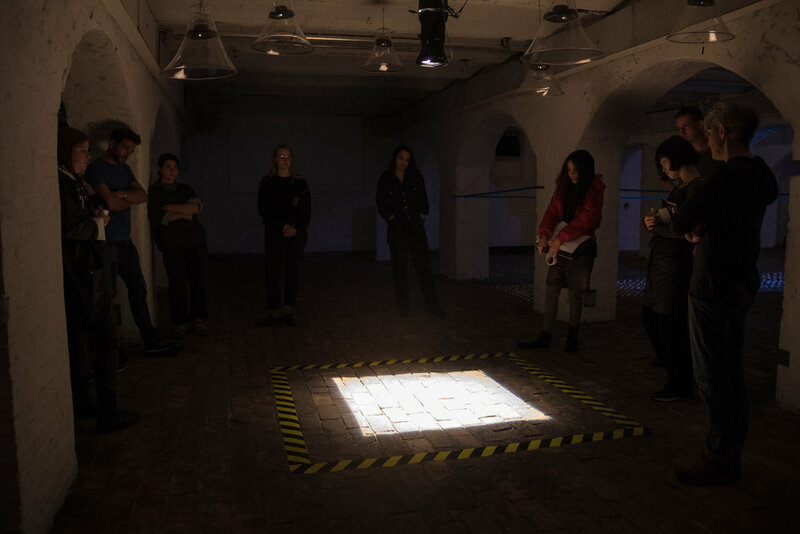 Installed in the former industrial rail station's basement, overhead speakers emanated the layered and fragmented sounds of people commenting on a demarcated light projection on the floor. A reexamination of the 2012 project “Talk Back”, here the multilingual voices of fellow residents and new acquaintances at ZK/U formed the base of the voice-audioscore. The resulting staged scenario conflated fact and fiction, as well as historical and present conditions of the site. During the Nazi period the location may have been a deportation site, late in the war it was a community warming and sleeping zone with an accompanying bunker. Today, the space is part of a lively international arts centre.